I’ve been a bit busy at work this week so I’ve not had as much time as I’d like to “prop” up for my first session of Judge Dredd tonight. My player aid for sentencing isn’t finished yet and I’ve just cobbled together stats for the perps the Judges will be up against (I’m running the introductory scenario from the original Games Workshop version of the rules) based on similar characters in scenarios published in Mongoose’s old in-house magazine Signs & Portents1. As previously posted though, I do have a custom character sheet and, from that, I’ve developed a simple layout for player handouts: Dot-matrix paper background and a dot-matrix font for the text. Yes, I know that Judge Dredd is the set in the future, but I love the idea that, even then, dot-matrix printers are running! Sure I could put the same information into a HTML file and load it up on my tablet to present to the players – and for a standard Traveller game I would certainly do that – but Judge Dredd has this vibe with me. Hopefully I’m not the only one. For those expecting minis and terrain, I’m not heading that way with Judge Dredd. If I manage to get some of the original cardboard figures then I might break them out with some maps for representational purposes2, but I’m aiming for “theatre of the mind” with this campaign. 1. 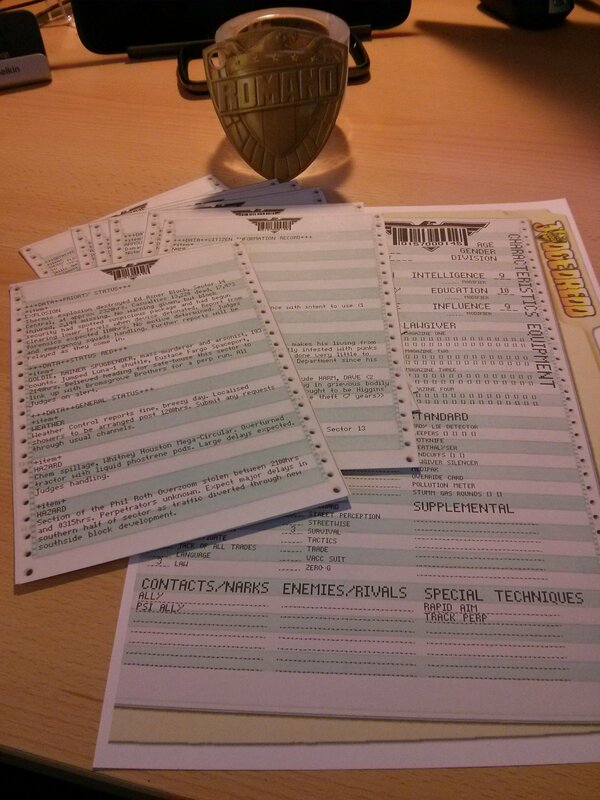 First annoyance with Traveller-powered Judge Dredd – there are no generic perp stats. Aliens? Robots? Even the Big Bads like the Angel Gang and the Dark Judges? Yup, they’re there. But average, everyday perps? The food and drink of Mega-City One? No! It’s not a major hassle but it is an annoyance. 2. Similar to how Star Wars: Age of Rebellion handles it in the Beginners Box actually.